NASA's Cassini spacecraft zoomed by two Saturn moons this week to take what scientists say are the last close-up views of the geyser-covered Enceladus and cratered Dione for several years. Cassini made the two-moon rendezvous on Wednesday (May 2), creeping within 46 miles (74 kilometers) of icy Enceladus before zooming by Dione at a distance of 5,000 miles (8,000 km), NASA officials said in a statement. Raw photos from the Saturn moon flybys reveal Enceladus as a slender crescent, while Dione appears as a battered and bruised body. "The flybys were the last close encounters of these icy moons that Cassini will make for three years," Cassini mission scientists wrote in the update. This raw, unprocessed image was taken by NASA's Cassini spacecraft on May 2, 2012. The camera was pointing toward Enceladus at approximately 239,799 miles (385,919 kilometers) away. During its approach to Enceladus, Cassini's cameras snapped new photos of the spectacular plume of water ice erupting from the moon's south pole. The geysers on Enceladus were first discovered by Cassini in 2005 and have been a target for researchers ever since. The eruptions produce a plume of water ice, water vapor and organic compounds through vast cracks in Enceladus' ice-covered surface. The geysers are so prolific that Cassini's cameras were able to see the plume from distances of between 259,000 miles (416,000 km) to 66,000 miles (106,000 km) from the moon. Cassini's radio science team also hoped to probe the interior of Enceladus during the flyby to determine if the moon is hiding pockets of liquid water at its south pole, or if some warmer-than-average ice could be responsible for the geysers. 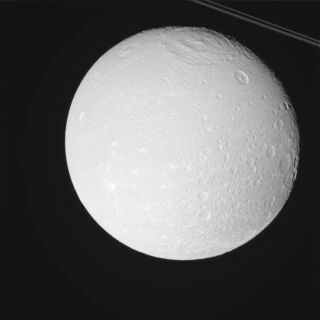 After the Enceladus flyby, Cassini turned its cameras on Dione even though a close study of that moon wasn't initially planned. Despite the vast distance, Cassini managed to create several photo mosaics to reveal amazing views of Dione, including a detailed look at a huge crack in the moon's surface known as Latium Chasma, according to a photo description. The camera was pointing toward Dione at approximately 8,416 kilometers away, and the image was taken using the CL1 and CL2 filters. This image has not been validated or calibrated. A validated/calibrated image will be archived with the NASA Planetary Data System in 2013. "Other mosaics cover much of Dione's northern hemisphere that faces away from Saturn in its orbit, focusing particularly on the moon's ridges, an ancient impact basin and the wispy streaks that Cassini scientists now know are tectonic fractures," NASA officials said. The Enceladus and Dione flybys are not the only Saturn moon encounters for Cassini in May. Later this month, on May 22, Cassini will fly by Titan, Saturn's largest moon. The Cassini mission is a collaborative project involving NASA, the European Space Agency and the Italian Space Agency. The spacecraft launched in 1997 and arrived at Saturn in 2004. In early 2005, Cassini released the Huygens lander, an ESA probe, which touched down on Titan to relay the first photos ever from the surface of that cloud-covered moon.